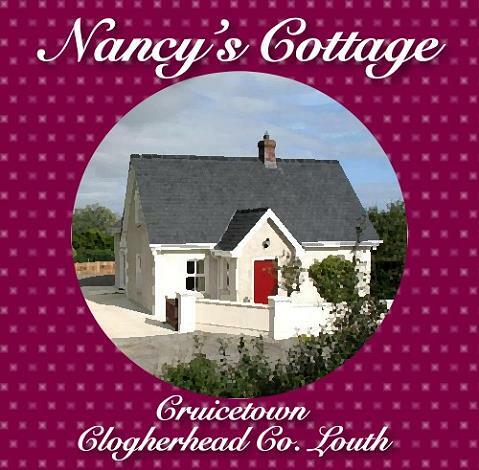 Nancy’s Cottage is a Failte Ireland approved (4-star) Self catering cottage located close to the village of Clogherhead, Drogheda, Co. Louth, Ireland, only a few minutes from the Big Strand beach and 10 min. drive from two great golf courses, Seapoint Golf Club & “Baltray” known as County Louth Golf Club. The central location near the coast offers plenty of possibilities for all kinds of activities – from long beach walks on the Big Strand to fishing on the pier in Clogherhead, or golfing in nearby world famous “Baltray” County Louth Golf Club and Seapoint Golf Club. The nearby villages of Clogherhead & Termonfeckin have plenty to offer in terms of shops, pubs, and restaurants.The local pub “Mollies” is just 2km away offering an opportunity to join the locals for a pint of the best Guinness in Ireland. If you’re looking for peace and tranquility in unspoiled rural Ireland this is the place to be. Holidaymakers are guaranteed a peaceful holiday with only the “dawn chorus” of the birds not forgetting the “Owls” to awaken you.